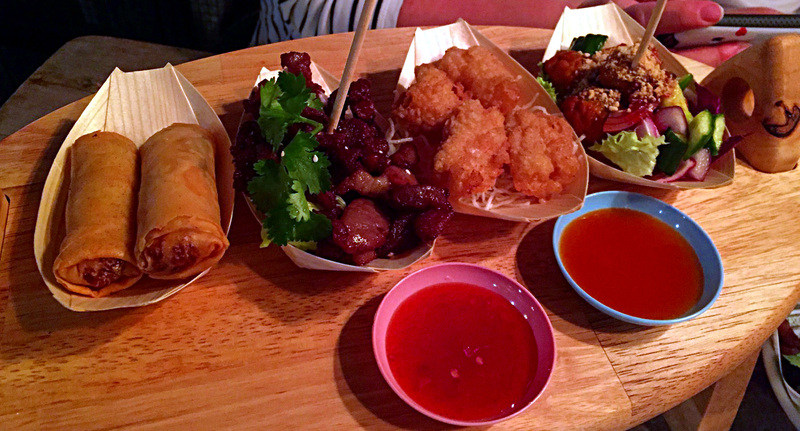 Thaikhun follows swiftly in the footsteps of Zaap bringing another new Thai food experience to Nottingham. This latest venture sits in the recently refurbished Victoria centre and is surrounded by all the other recently opened eateries. Wood is the order of the day with the décor , the attractive multi-level styling is a little more laid back than Zaap but still retains plenty of detail to catch the eye. The menu is pretty substantial with favourites like Pad Thai as well dishes you’ll likely never have heard of. A sharing platter is a good way of testing the credentials of somewhere and this allegedly included their best sellers. Spring rolls were a good example of the kind, though struggling to be exciting. Fried squid had a batter that could have been better seasoned and crispier, though the seafood remained well cooked. Fish cakes were the best element, fragrant with lemongrass accompanied by lightly pickled vegetables. Honey roasted pork was also nice, a touch dry but good flavour and a decent portion of it too. For main courses we went for a range of dishes. My regional special was Khao Ka Moo, braised pork in a five spiced broth with greens and a chilli garlic sauce. The meat had taken on good flavour from the cooking, though was a little fatty. The chilli sauce was very good and the greens cutting through both that heat and fattiness. The thing that stuck most was that the rice was excellently flavoured, almost in the style of sushi rice. A “must try” dish, according to the menu, was some thin noodles with tofu and vegetables. Unless it was where they were making the most margin I fail to see how they decided it was a must try. It wasn’t a shocker just quite boring, some crunchy veg but no real flavour to the dish. When tofu is the main constituent it needs to be enhanced with something. A chicken massaman curry meant there was a direct comparison to Zaap. 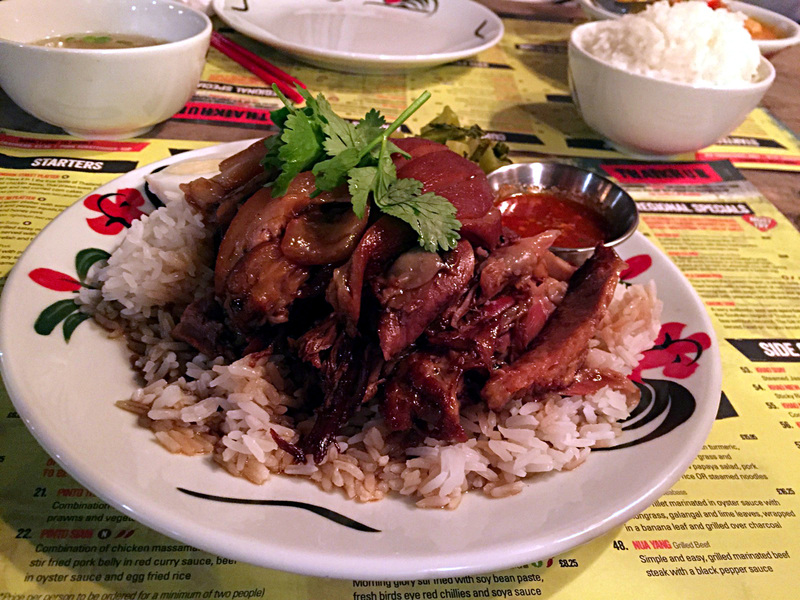 I preferred the version here, it was a little lighter, yet spicier and had really moist chicken. The only negative was the potatoes which were a little odd, they were smaller new potatoes that actually had too much of their own flavour. The cost was pretty reasonable, £9 for the curry including rice which is similar to Zaap and is good value. I was impressed by both the food and surroundings at Thaikun, both that little bit better than my experience at Zaap. If you want a fully polished and extremely consistent experience Tarn Thai might still be the place to go but Thaikhun isn’t far behind. I’ll be back to try more of the menu. I can’t comment on Zaap. 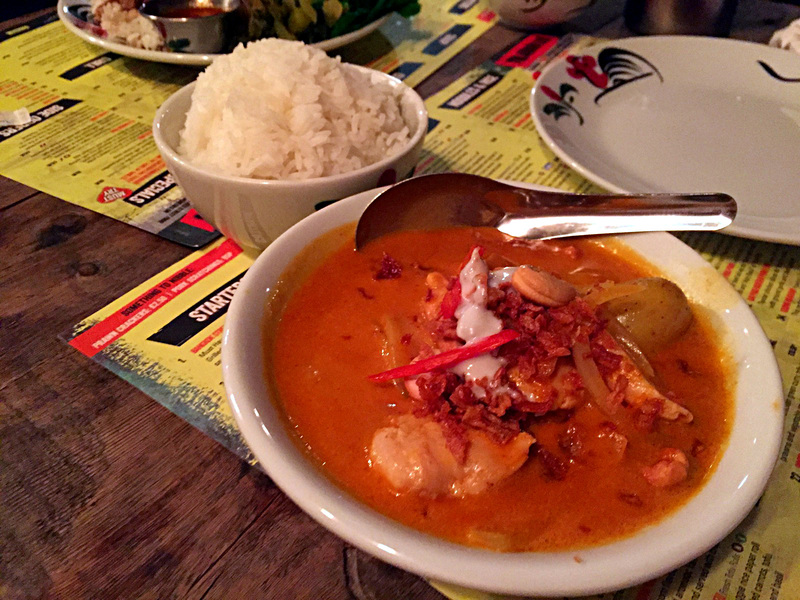 However – I found Thaikhun very authentic and offer quite a lot of healthy choices. They are also very warm welcoming when you first arrive and the decor is very good throughout. I would highly recommend them and the cocktails was ridiculously good when we tried them. Glad you enjoyed! I’m sure cocktails will become very popular on their terrace in the summer!